Paul McKee will hope to upstage at least some of the younger brigade in the 400m at this weekend's Irish Indoor Championships at the new Athlone venue. 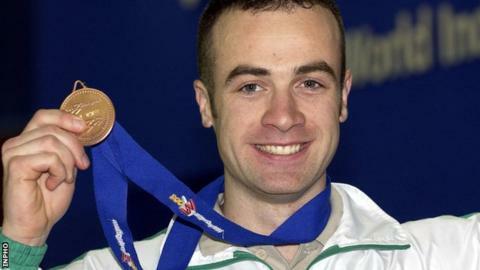 2003 world indoor bronze medallist McKee is now coaching a group of Belfast-based athletics which includes the emerging Jason Harvey. McKee and Harvey are both in a 400m entry along with Brian Murphy. Current European indoor number one Brian Gregan will move down in distance to tackle the 200m. McKee showed good summer form last year as he clocked 47.67 to take second behind Murphy at last year's Irish Outdoor Championships. However, the 35-year-old Belfastman will probably have to go some to hold off his protege Harvey, who clocked an indoor personal best of 47.87 last weekend. Gregan will be looking to improve his indoor 200m best of 21.27 as he continues his build-up towards the European Indoor Championships next month. He set his European leading mark of 46.07 on the Athlone track a couple of weeks ago and with Steven Colvert expected to concentrate on the 60m, Gregan should take the gold. Other big names in action at the impressive new Athlone facility include Fionnuala Britton who will continue her build-up for the World Cross Country Championships by taking on Roseanne Galligan in the 1500m. Derval O'Rourke competes in the 60m hurdles after winning the British title last weekend and then improving her season's best to 8.08 in midweek. London Olympics fourth-placer Robert Heffernan will open the championships in the 5K walk on Saturday afternoon while talented Letterkenny lad Mark English is scheduled to compete in the men's 800m. English's rivals over the four-lap event should include his club-mate and 1:47.79 man from two season's ago Darren McBrearty. City of Lisburn athlete Amy Foster will be favourite to retain her women's 60m title as she leads the Irish rankings with a 7.39 clocking. Dean Adams will be among the contenders in the men's 60m while Newcastle's Kerry Harty will take on European Cross Country team gold medallist Lizzie Lee in the women's 3000m.